Leave Windhoek and drive via the Remhoogte Pass to Namib Desert Lodge. In the late afternoon a sundowner drive through the magnificent scenery and to the top of the petrified dunes takes place. Dinner/ bed/breakfast at Namib Desert Lodge/ NNL/ NNL Soft Adventure Camp or similar. After an early morning departure you will experience the spectacular dune landscape of the Namib, boasting the highest dunes in the world. Revere at the foot of the 300m apricot-coloured mass as it towers skyward. The energetic among you may even be tempted to conquer the dune. After viewing the nearby Sesriem Canyon, we proceed northwards along the eastern border of the Namib Naukluft Park., back to Namib Desert Lodge. Enjoy the afternoon at leisure. Meander about the unusual landscape or relax at the swimming pool. 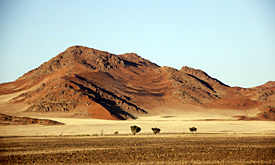 Drive via Solitaire, Gaub- and Kuiseb Pass into the Namib Naukluft Park, passing fantastic rock formations. We reach Walvis Bay in the afternoon. Bed/breakfast at Protea Pelican Bay Hotel. At 08h00 we board a motor boat/ Catamaran for a 3-hour boat trip. During this time we will see and have the opportunity to observe the many seabird species. Seals and dolphins soon become a topic of conversation as they accompany the boat on its journey. We will idle within arm’s reach of enormous seal colonies, whilst on board enjoying fresh Atlantic oysters, open bread rolls, and South African sparkling wine and light drinks. Afterwards continue to Swakopmund. On request (and at own cost) activities can be arranged. Bed/breakfast at Swakopmund Plaza Hotel/Probst Hotel. 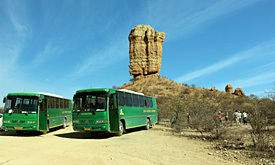 Early departure direction Twyfelfontein. Viewing of the Twyfelfontein rock paintings and rock engravings and the burnt mountain – a testimony to Namibia’s very early and eventful human habitation. Dinner/bed/breakfast at the Twyfelfontein Lodge/ Damara Mopane Lodge or similar. Today we view the Ugab terraces and the “Fingerklippe”, a 35m high sandstone column, with a circumference of 44 m, before continuing our journey to the Etosha National Park. First short game drive. Dinner/bed/breakfast at the Toshari Lodge or similar. rainy season the pan resembles a huge lake, but this soon evaporates during the dry season, leaving behind a shimmering sediment causing mirages to play havoc on the eyes. 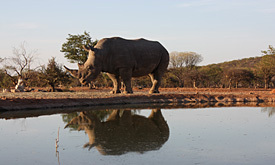 A visit during the dry season, May to October, is certainly the most rewarding time for game viewing. Huge herds of game assemble at the waterholes in the early mornings and before dusk, entertaining the audience with their different antics. Whole day game viewing in the park. 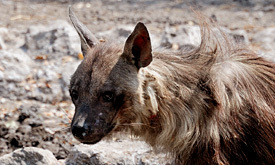 Dinner/bed/breakfast at the Mokuti Etosha Lodge or similar. 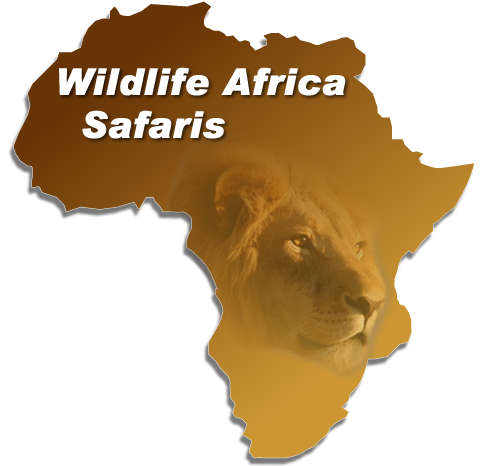 Another day is spent with game viewing in the Park. In the late afternoon proceed to a lodge bordering the park. Early departure direction Windhoek. Arrival in Windhoek in the afternoon.